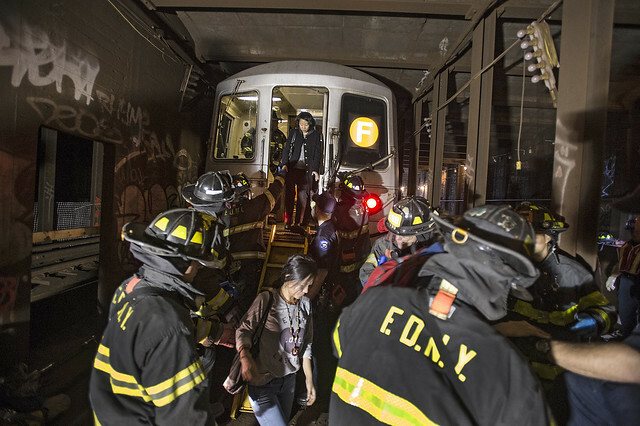 Emergency service workers responded to the derailment of an F train under Broadway and 60th Street in Woodside, Queens. Photo: Metropolitan Transportation Authority / Patrick Cashin. Updated (5:00 p.m.): For the latest on service in Queens, please refer to my new post on evening service. I won’t be updating this post any further. Updated (1:25 p.m.): The MTA is reporting that a Manhattan-bound F express train derailed at around 10:30 a.m. near 65th St. in Queens. According to the agency, the middle six of the train’s eight cars jumped the tracks while the front and rears cars stayed in place. Over 1000 passengers were evacuated, and 19 were injured, four seriously. As the evening rush approaches, the MTA does not anticipate regular service along the Queens Boulevard line. The 7 train will run all weekend to carry some of the burden, and the LIRR is currently cross-honoring MetroCards. There is no train service between 71st Av-Forest Hills and Queens Plaza in both directions. There is no train service between 71st Av-Forest Hills and 21 St-Queensbridge in both directions. There is no train service between Forest Hills-71 Av and Essex St. There is no train service between 71 Av-Forest Hills and Queens Plaza in both directions. Some northbound trains are running on the line from 57 St-7 Av to Queensboro Plaza. Anyone trying to reach the JFK Airtrain should take the A train or LIRR, and other customers are advised to take the 7, J or L trains for service into Queens. LIRR is cross-honoring MetroCards at Sutphin Blvd-Archer Av, Kew Gardens, Forest Hills, Woodside, Nostrand Av, East New York, Atlantic Av-Barclays Ctr and Penn Station-34 St. Shuttle buses are between Queens Plaza or 21 St.-Queensbridge and Forest Hills. Prepare for crowded and slow rides. I’ll have more information as it becomes available. For more photos from scenes of the incident, check out the MTA’s photo album on Flickr. U/D Queens: There are Aprox1000 people on derailed train in Subway tunnel. 4 of them on oxygen Evacuation in progress at emergency exit. Yesterday the F train driver was going WAY above the normal speed limit. I though the train was going to derail. I rather have the train drive by itself than entrust my life some idiot. I’m curious as to how you know: a) the “normal” speed limit (as opposed to an abnormal one?) in the area you’re referring to; b) the exact speed of the train you were on and thus that it was going “way” above the limit without hitting its own physical speed limit. Also, the MTA uses timers to keep trains from going too fast in most places, so it’s rather difficult to go “too fast” nowadays. The trains themselves top out at 55 mph, anyways. *If you’re a transit employee with years of experience and can basically gauge on the fly what’s the speed and know of the speed limits that are supposed to exist on the tracks, disregard my question. Its about time MTA needs to start regulating train speed limits. You hear too much about train derails these days. The last thing this city needs is even slower subway speeds. When was the last subway derailment anyway? I think the last time was on the Upper West Side A train derailed at 81st street. That was December 2012, right? And the one before that I think was in 2009. I’d say we don’t need slower trains. I’m not sure a derailment per 2.5 years is an acceptable risk. But honestly, the American obsession with lowering speed limits in lieu of improving maintenance standards is both unsafe and bad for passengers. Just how much worse is the maintenance on the NYC subway compared to other systems? Much worse. And it’s only going to get worse under our current state leadership. To be fair, our system doesn’t have the luxury of shutting down overnight for maintenance. Can’t imagine it being worse than Chicago. Train speeds are regulated at certain points (such as tight curves) through the use of speed detectors via track circuits. I’m not sure about that area, however. Let’s await the results of the investigation before jumping to conclusions about whether it was from overspeeding, from construction work or from a failed switch/equipment. What’s weird is if this was at/around 65th St, there are no curves or switches there. The only possibility in that realm is if the derailment occurred at the switch between the local and express tracks leaving Roosevelt, and the first cars either managed to remain on the tracks, or the switch moved while the first car was passing it, derailing the middle cars, and then the momentum carried the train into the tunnel toward 65th st before stopping. But if it wasn’t that switch outside Roosevelt, it wasn’t a switch or curve. Speed limits are already way too low. The slight improvement in life expectancy from increased safety is not worth the extra hours of my life spent on the train. They’ve been doing an awful lot of work in that section of the tunnel lately. Obviously we don’t know the cause yet, but I can’t help but wonder if there’s a connection. I think it way too early to theorize about the cause of the derailment. The interesting part will be dealing with the aftermath of the derailment, attempting to restore service, dealing with track areas that are marked for slow speeds, diverting as many as possible subway riders to the bus systems to get home, etc. Of course there will be an investigation and a report about this derailment, how and why it happened, what to do to help make this occurrence not happen again, possible changes in rules or procedures, etc. In due time, in due time. This despite the fact that the deferred maintenance hasn’t even started yet. It’s due to begin in 2015. I will say, those R46’s don’t have the best track record. This area has also seen recent Fastrack repair work and has seen plenty of track replacement over the past 10 years. Let’s definitely wait for the investigation before jumping to conclusions.